Silk Road International Symposium (SRIS) is an extraordinary communicating event for academic and professional development which is held by Xian Jiaotong University (XJTU) for outstanding young scholars from all over the world. Meanwhile, XJTU would also like to take this opportunity to facilitate the communication and collaboration between the invited scholars and XJTU faculties, present XJTU’s talents recruitment schemes and attract interested distinguished scholars to join XJTU. Apr 12th -13th: Parallel Sessions, meeting with school leaders/distinguished professors, Lab tour etc. For further information about SRIS, please contact the secretariat by sending E-mail to xjtusris@xjtu.edu.cn or via phone at +86 29 8266 6336. XJTU, as one of the first universities entering Chinas "211 Project" and “985 Project”, is selected to be developed into a global first-class university. XJTU is a comprehensive research university with scientific focus. It is composed of 10 branches of disciplines, namely: science, engineering, medicine, economics, management, literature, law, philosophy, education and art. In recent years, XJTU focuses on national strategy, vigorously promoting the establishment of the Western China Science & Technology Innovation Harbour, which is designed to be an innovative unit with a union of “campus, industrial zone and community”, a combination of technologies and services, and a link center of science, technology and industry. 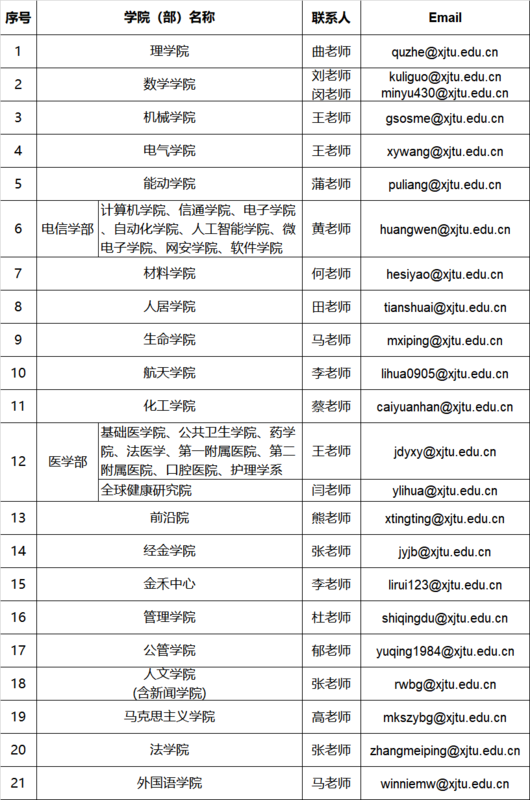 Now, XJTU is on the List of World-class Universities and First-class Disciplines (abbreviated as “Double First-class”) released in 2017 by the Ministry of Education of China, as a Double First-class university in Category A, which means that the government will support it financially to develop into a world-class university, and its eight disciplines into the first-class level in the world.